Let me just put it out there: #sorrynotsorry. Let’s face it – pork chops can be boring. And dry. And bland. Not you’d find any of that on this fabulous blog. I don’t tolerate any of those things. This recipe is on my diet. Not a trend diet either. I still eat carbs. And sweets. And dairy. This is totally okay. I mean, if you want to make it not okay, that’s easy. But I use lean cuts of pork. And turkey sausage…which is delicious even when it’s not seasoned, mixed with vegetables and stuffed inside of a pork chop. 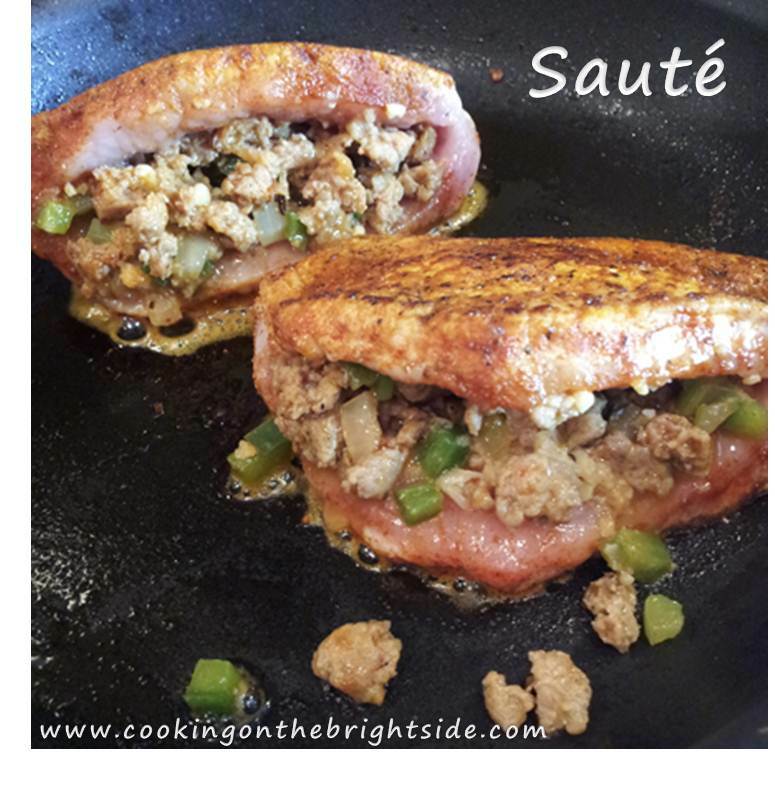 I found this beauty in Southern Living (always my “happy mail day!”) – and while I set out to stick to the Cajun roots of the dish with some andouille flavored chicken or turkey sausage, I had some Italian turkey sausage I needed to use and it did the trick! Adapted from original recipe, found here. In a medium skillet, cook your sausage over medium for about 5 minutes, breaking apart into crumbles. Cook through and add sausage to a medium bowl, reserving drippings in the skillet. Sauté onion, celery, bell pepper and garlic for 5-7 minute until tender. 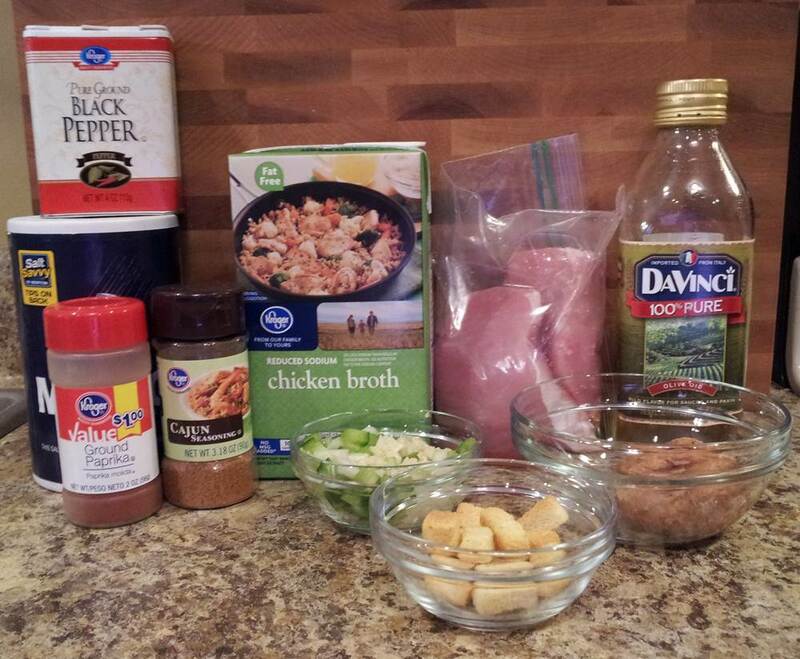 Add vegetable mixture to sausage and stir with Cajun seasoning, croutons, and chicken broth. Season your pork chops with paprika, pepper and Cajun seasoning. Once the chops have been seasoned, cut a pocket in each one – be careful not to cut through to the other side. Spoon sausage mixture into each pocket. You can over stuff at this point, a little will likely fall out while cooking – so don’t fret! Heat olive oil in a medium skillet. 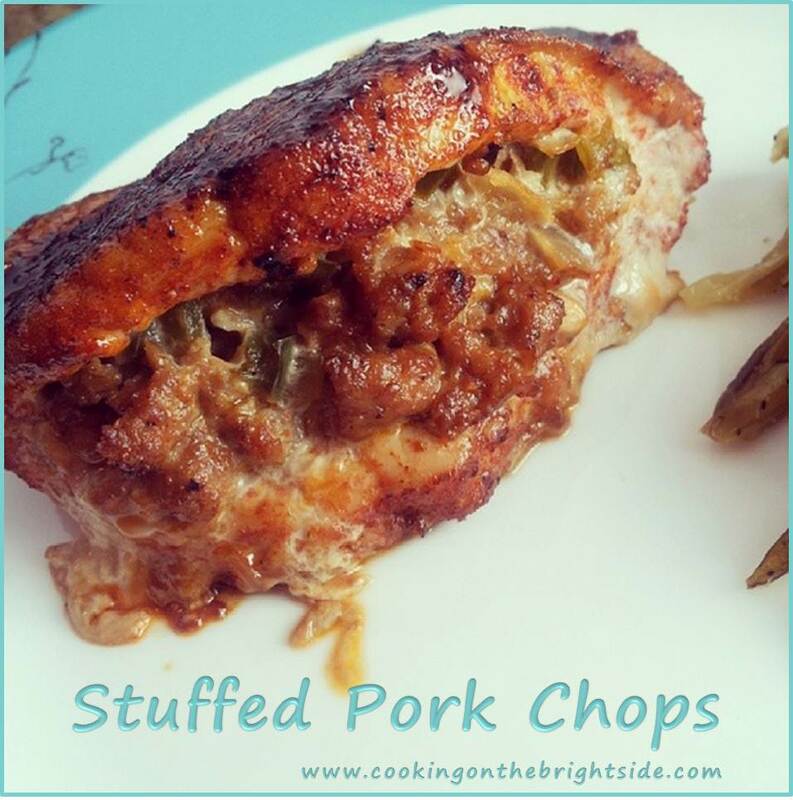 Add stuffed chops to the skillet and cook 3-4 minutes per side. Transfer the chops to a baking dish and bake for 30 minutes or until cooked through. 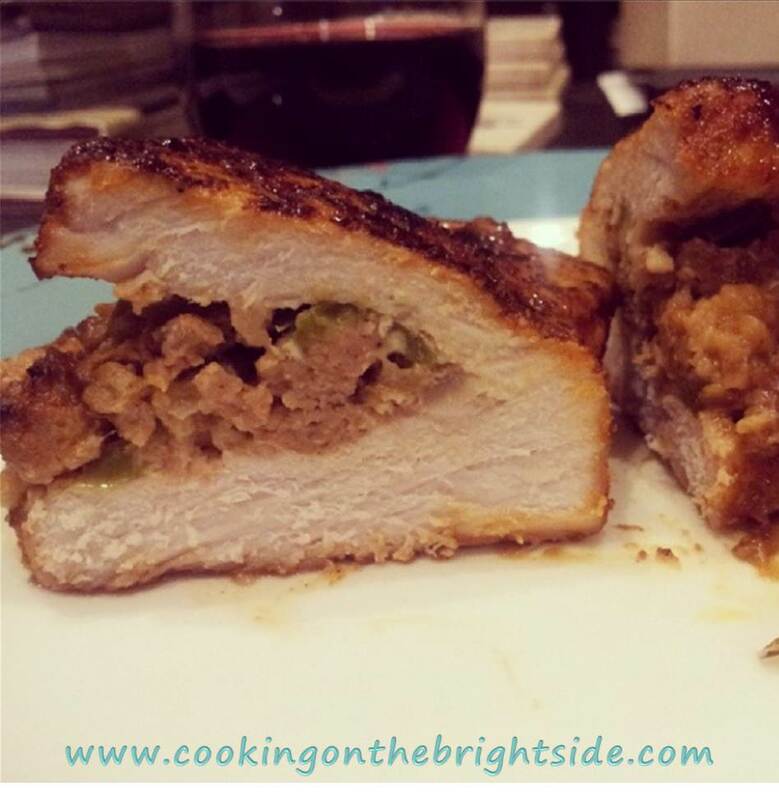 This entry was posted in Main Courses, Pork and tagged cajun stuffed pork chop, march madness recipe, meat stuffed meat, weight watchers main course recipe, weight watchers pork chop, weight watchers stuffed pork chop, weight watchers turkey sausage by cookingonthebrightside. Bookmark the permalink.